The battle between the sexes is never-ending, frequently all-consuming, and filled with joy. The conflict is unique, with both contenders either winning or losing, and the treaty resolving the issues can be so blissful! 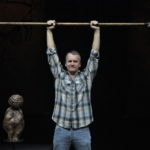 Revealing well known foibles alongside contemporary views of feminism and masculine behavior, “Defending the Caveman” is the longest running solo show on Broadway for a very good reason! Noted comic Rob Becker first premiered the one man show to delighted audiences in 1991, a treat Becker, himself, performed for many years. Since then other actors have presented the show, among them is actor and comic John Venable. The perfect caveman, Venable hilariously demonstrates and informs, giving us a sweet Valentine treat for Oklahoma audiences courtesy of Oklahoma City Repertory Theatre. Showing at Oklahoma City Community College the weekend just before Valentine’s Day makes this perfect holiday timing. The dates, Friday, February 10, 2017 and Saturday, February 11, 2017 make “Defending the Caveman” perfect for ‘date night’ with your special someone. Curtain is at 7:30 pm on Friday and Saturday night with a 1:30 matinee performance on Saturday afternoon. Did playwright Becker and performer Venable eavesdrop on your marriage to get such an accurate and funny perception of personal feelings? Surely not, but the show hits the nail on the head—for both sexes. Much more fun than a session with a couple’s therapist or a disinterested bartender, “Defending the Caveman” has answers that entertain the mind and the heart, as well as the funny bone. The first thing one learns about living with a lover is that you can’t begin to understand him and you can’t begin to understand her. It’s impossible! Accept that, accept your lover, and you have half a success. Then bring out your sense of humor and laugh yourself silly. The best way to do that is to watch “Defending the Caveman” this coming weekend. A complete success! Gleefully giggle and guffaw until you cry, and then chuckle with respect. CityRep is proud and excited to bring John Venable back to Oklahoma City to reprise the success of “Defending the Caveman” and OCCC is proud to bring him to the Oklahoma City Community College’s Visual and Performing Arts Center at 7777 S. May Avenue in South Oklahoma City. Tickets can be obtained by calling the box office at CityRep (405-848-3761) or the box office for OCCC (405-682-7579) or visit CityRep on line at www.cityrep.com.